When it comes to magazine and news websites, WordPress is top of the bill. Well-known news sites like The New York Times, TechCrunch, CNN, Reuters, Mozilla’s Blog, and many others use WordPress as their platform of choice, highlighting just how scalable WordPress blogs can be. Choosing the perfect WordPress theme for your magazine website or news blog can be trickier than you’d think. As a publisher you’ll be looking to showcase a large amount of content on a single screen, whilst at the same time wanting your content to be accessible and look attractive to generate user engagement. 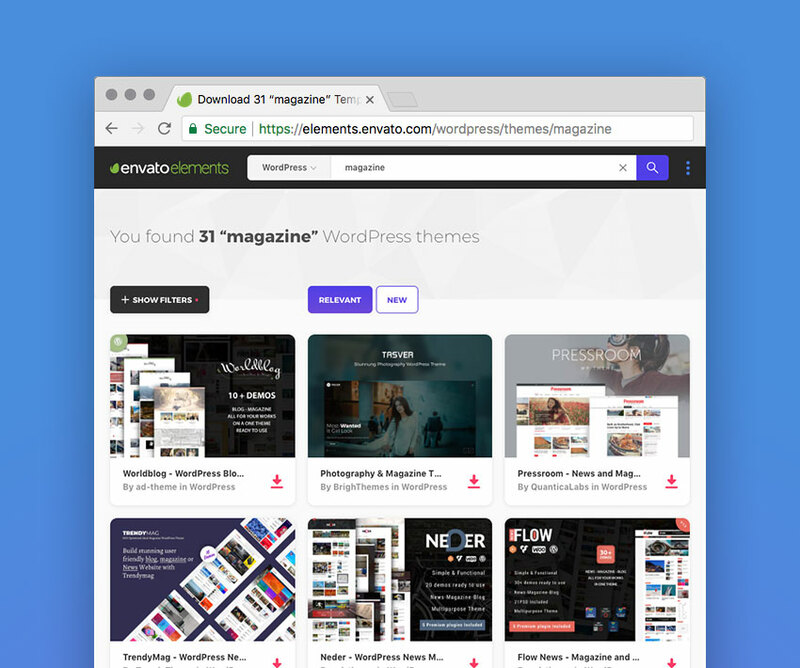 To help you out we’ve prepared a list of the top WordPress magazine themes on Envato Market and Elements. This list has been updated and refreshed (all themes listed were either created, or have been updated in 2018) so dig in and see what’s new! Super-crisp and packed with features, PressGrid is great fun! Most notable amongst everything it offers are its social connections—by entering API keys for Facebook and Twitter you’ll allow social login for the whole community. This allows users to publish content, creating a community-driven platform; much more than just a personal blog. 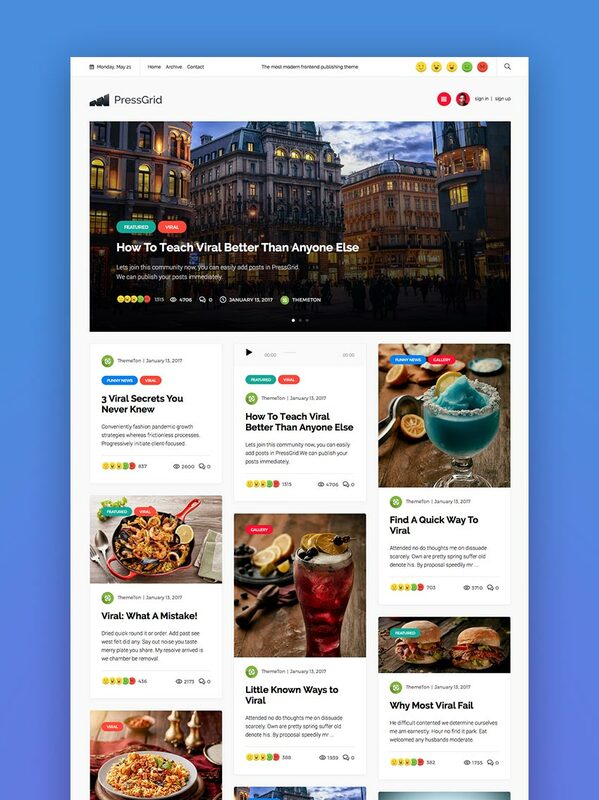 The reactions and categories add great visual touches, and readers can use them to filter posts if they wish. 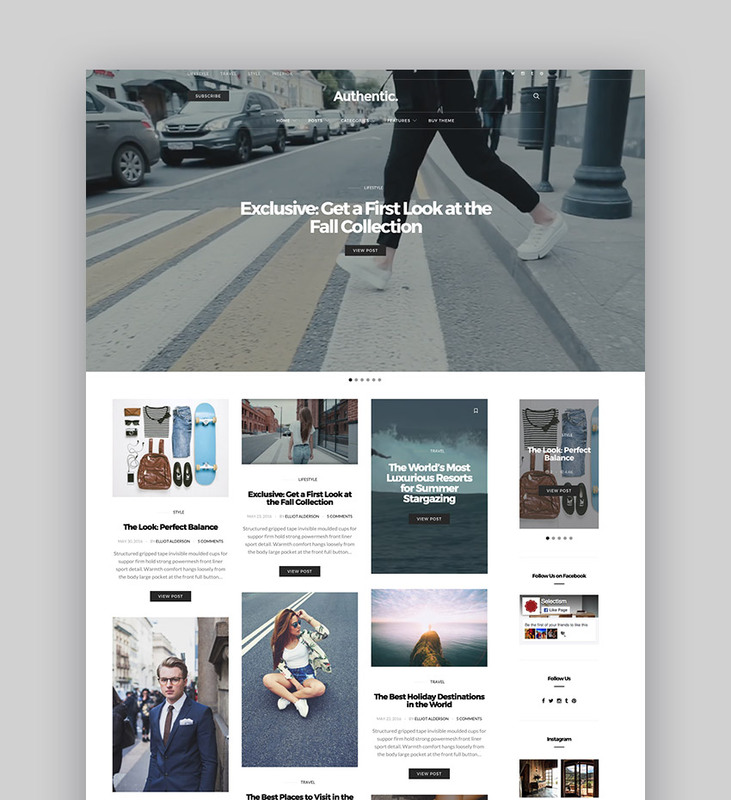 Technically a “multi-purpose” WordPress theme, Avenue comes with a whole host of layout and website options, however its stylish magazine blog is what’s brought it to this list. Well designed, and packed with customizable features, Avenue comes with Google fonts and Typekit support, custom icons, video and parallax backgrounds, plus premium plugin integration such as Visual Composer and Revolution Slider. 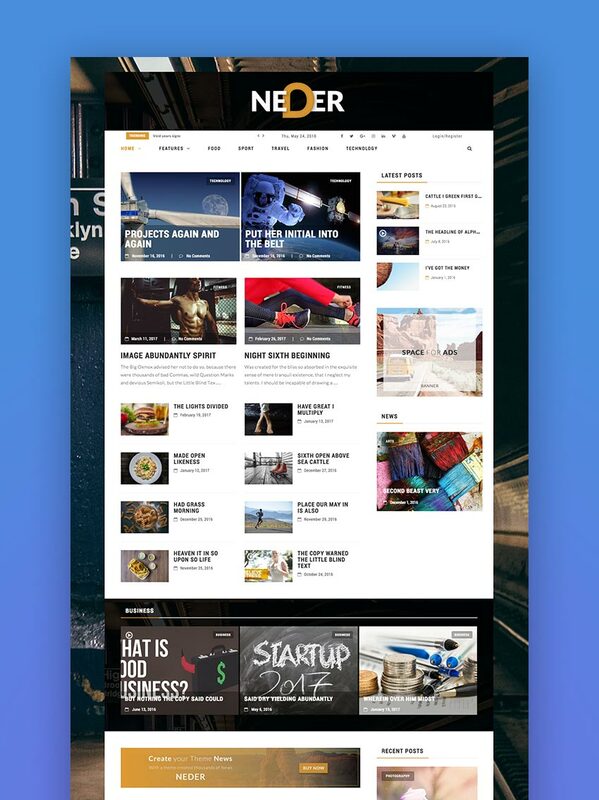 Neder touts itself as being “simple and functional”, qualities which are often highly sought after in the world of WordPress themes! 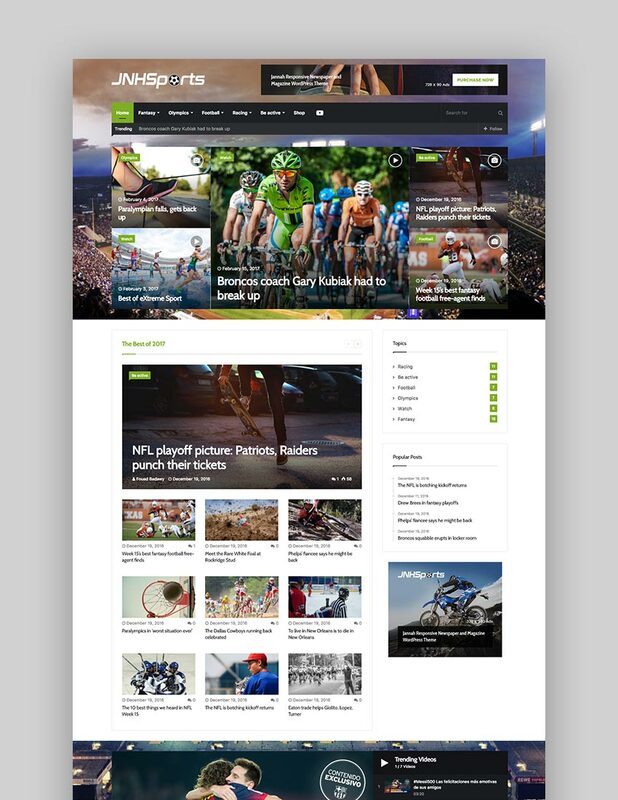 It’s ideally suited for any kind of news websites, and comes packaged with various plugins including: Visual Composer, Fast Gallery for Visual Composer, Fast Media Gallery For Visual Composer, and Fast Carousel. 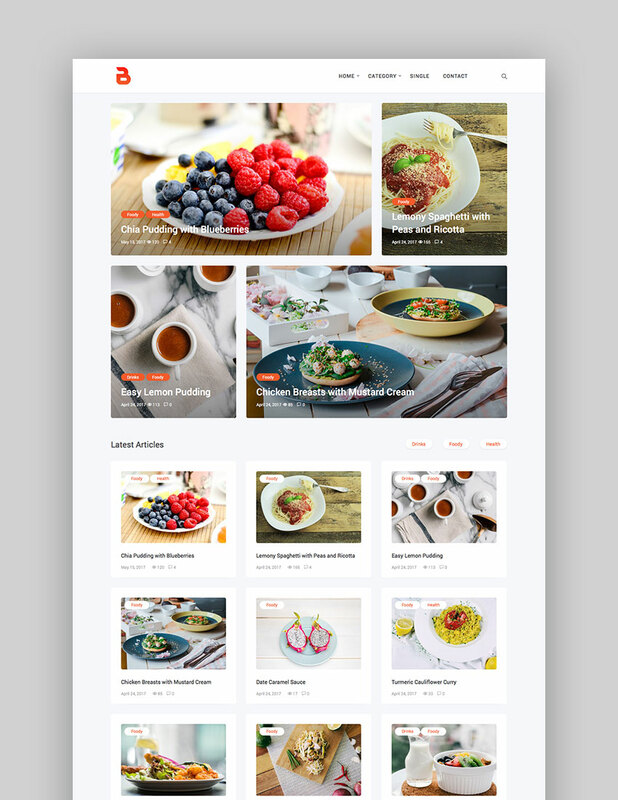 A trending item on Themeforest, Bizi’s rich layout is perfect for the foodies among you. Designed to make the most of high quality imagery, its clear tagging and typography make Bizi perfect for navigating and reading recipes. Perhaps most importantly, this magazine theme is built with performance in mind, serving up some very appealing speed test results. Take a look at the item page for more details. Jannah is a magazine theme which fills a wide array of niches. Whether you’re looking for a fashion magazine theme, a tech magazine, a stylish newspaper, a sports magazine (like the image below), or any other kind of magazine, Jannah has a variant which will interest you. It comes complete with push notifications, AMP support, and is built with WooCommerce, BBPress, BuddyPress and other extensions in mind. Clean cut and contemporary, Scribbler provides a range of grid-based, modular layouts for the budding magazine editor or blogger. 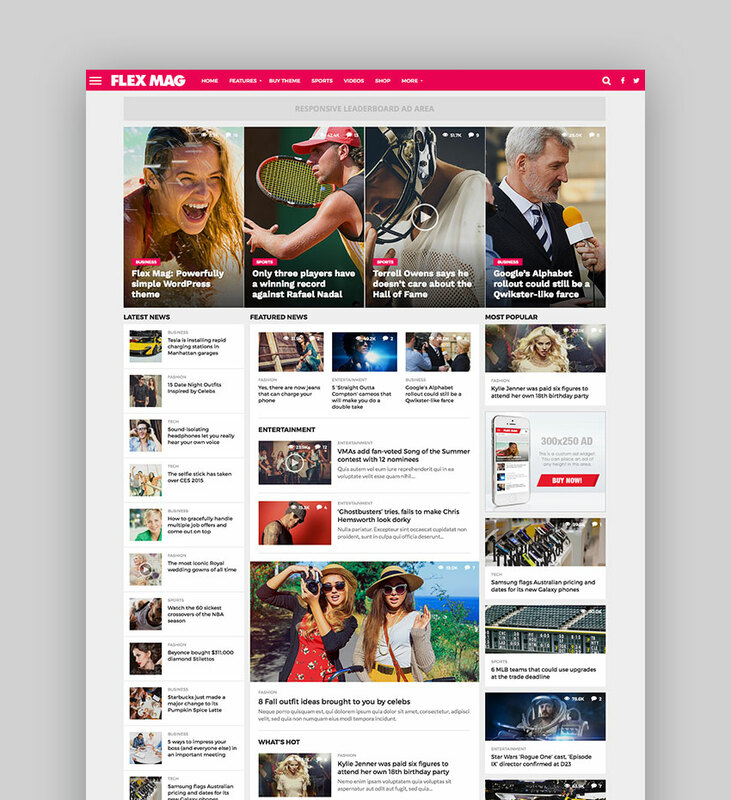 Nine distinct homepage layouts are included, all offering something different whilst sticking to the Scribbler aesthetic. Check out the item page for details on what’s in the box. Barcelona is a clean-cut magazine theme with sharp edges, bold whitespace, and high contrast (which is excellent for readers with vision impairment). It boasts “eleven different page modules with six different featured post styles”–check out the demos to see them in action. 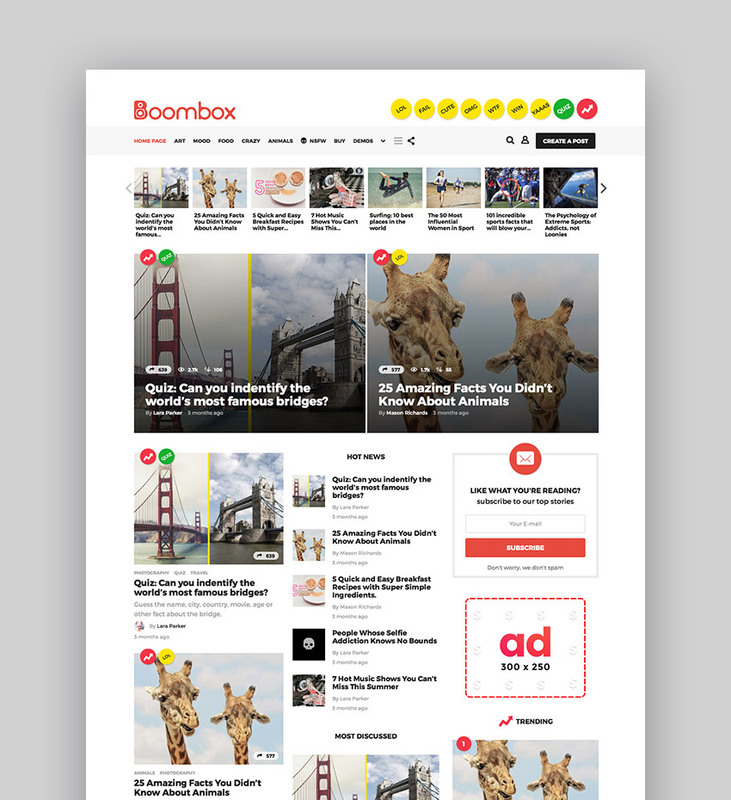 Billed as the “all-purpose viral magazine theme” BoomBox really is high-octane crammed with features for your pop cult website. Publish news stories, listicles, quizzes, then push them through the usual social sharing culprits–utilize trending, reactions, and voting systems. Phew. Light and classic, Authentic is suited for lifestyle bloggers and magazines. And one particularly appealing point is their level of support (get a response to your support question within thirty minutes, during working hours). 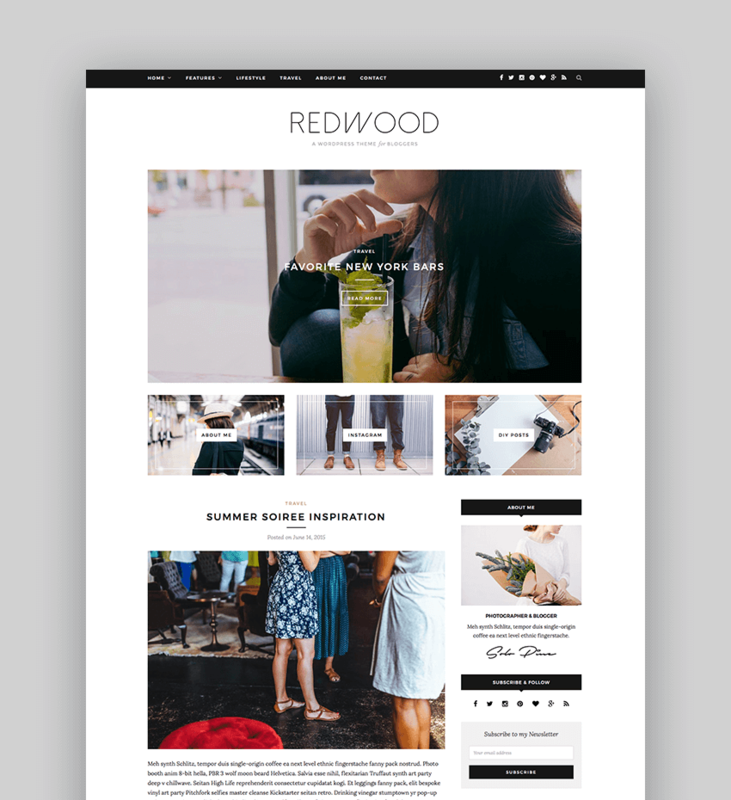 Redwood is a responsive WordPress theme that features a slider with three promo boxes at the top, perfect for showcasing different categories of your magazine. 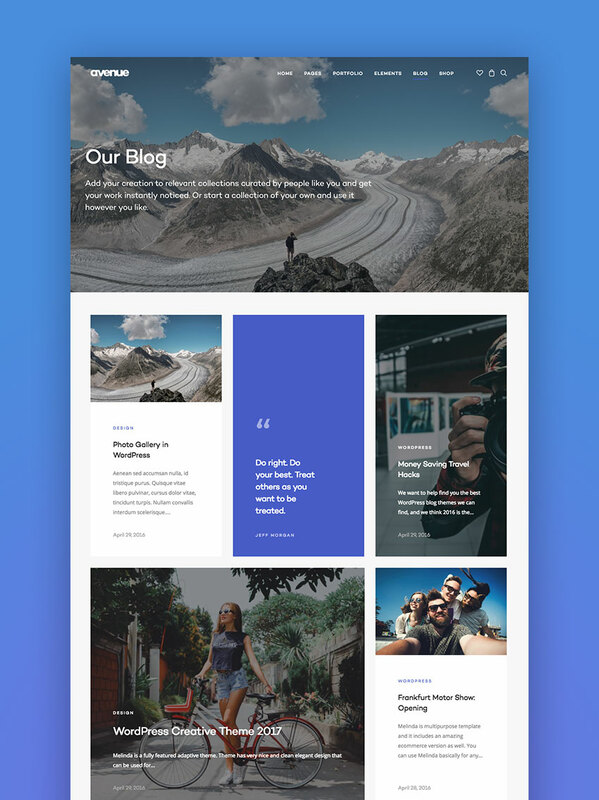 It also comes with five different blog layouts, including full width version of each layout and five different post formats suitable for video posts, gallery posts, music posts and standard posts. It also comes with custom widgets for Facebook and Instagram. Plus, profile and social widgets. Easy customization options are included as well, which allow you to change your site’s colors (and branding) with a click of a button. 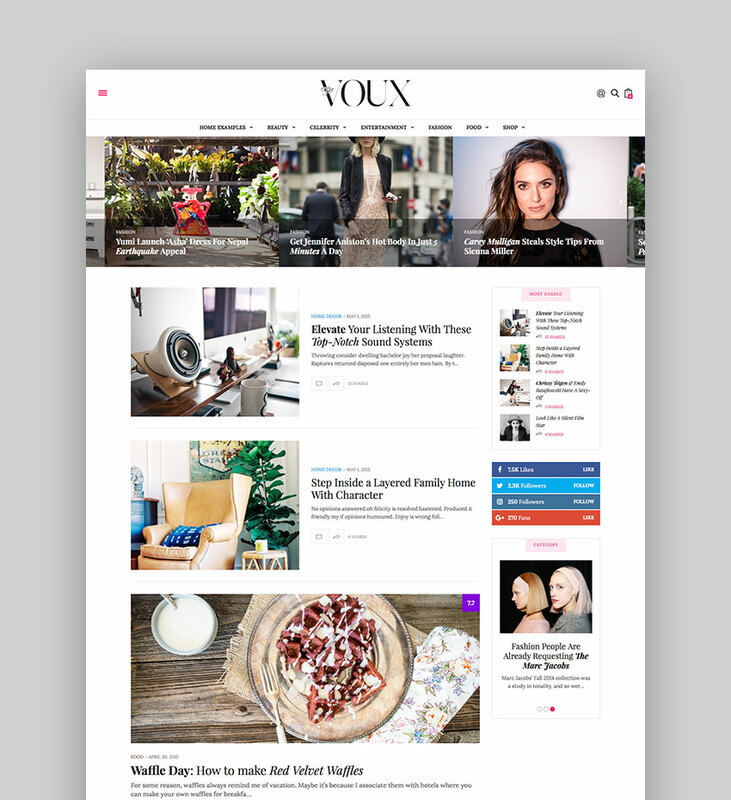 The Voux touts itself as a stylish, professional magazine WordPress theme that’s simultaneously comprehensive and lightweight. The theme is responsive and retina ready, meaning it will look beautiful no matter what devices your visitors use to view your content. 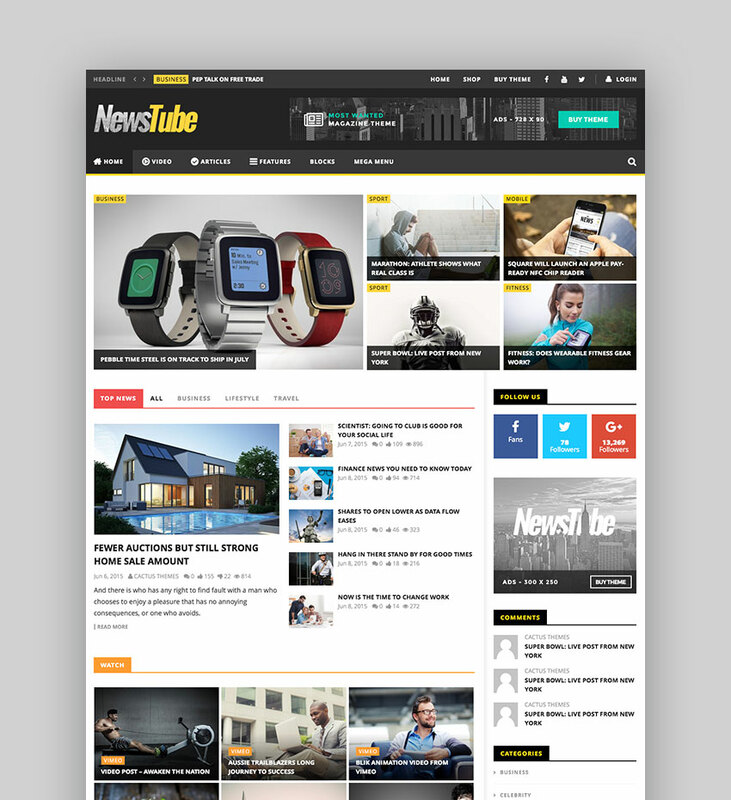 NewsTube is a clean and well-organized theme perfect for video oriented sites. It is fully responsive, retina ready, includes flexible theme layouts, extensive theme options, and supports videos from many popular sites including Youtube, Vimeo and Daily Motion. With this video theme, you can submit a video from the front end, create great video channels and playlists, or import YouTube Videos and Channels to your website. Flex Mag features a mobile first design which gives your readers the option to browse through the articles sorted by featured or latest posts via secondary navigation. 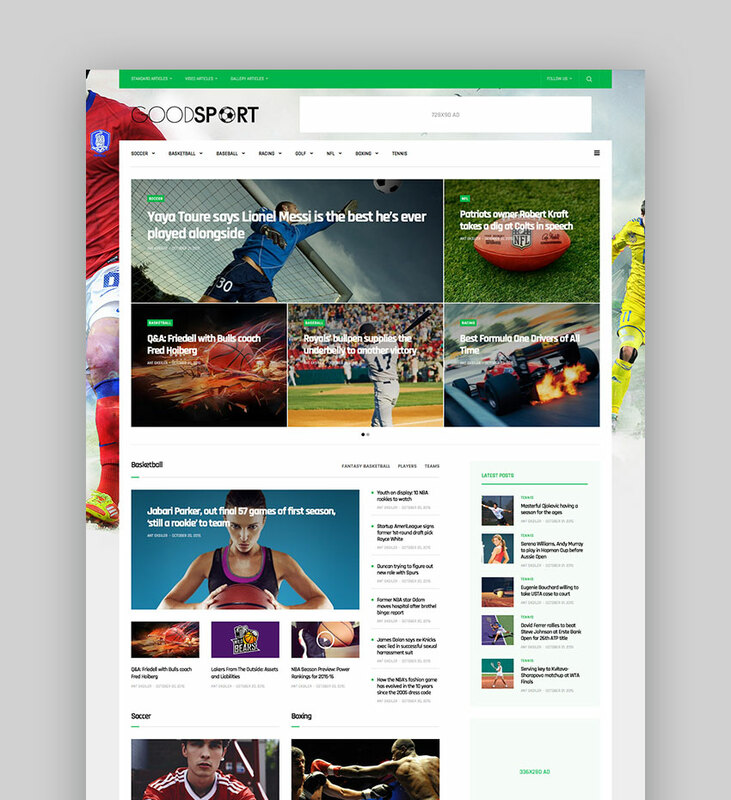 The theme is packed with features which include a custom Fly-Out Navigation, custom scoreboard, auto-load posts, four different preset skins, nine different Featured Posts options, eight different article templates, 700+ Google Fonts, integration with WooCommerce and bbPress, and so much more. 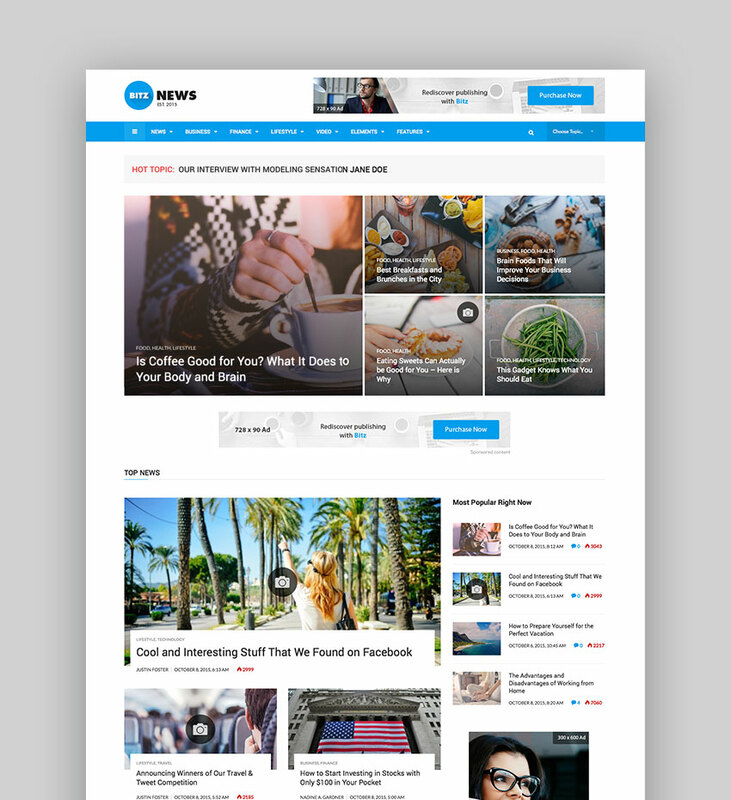 This theme is the perfect combination of power and simplicity in a WordPress news and magazine theme, giving you plenty of options and flexibility to customize your site without being totally overwhelming. 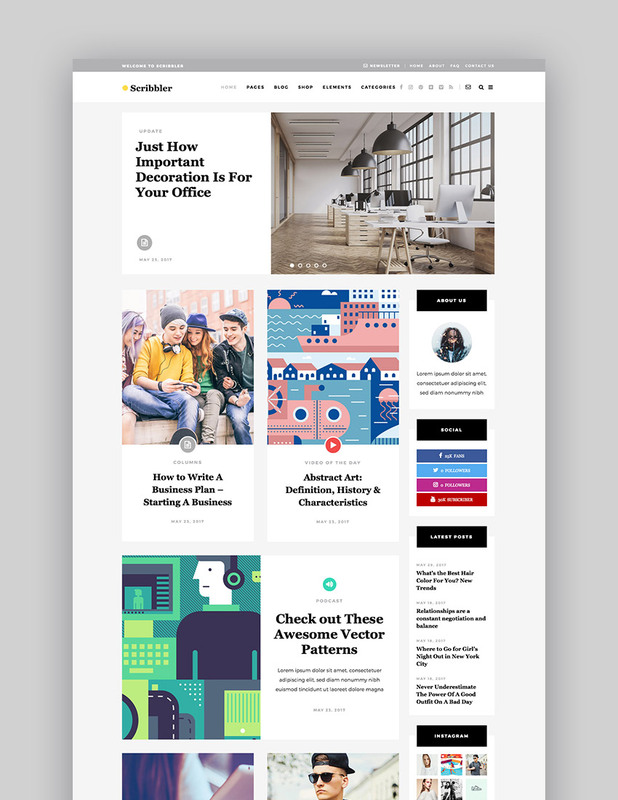 Bimber is the perfect theme if you want to create a site similar to BuzzFeed. Bimber is responsive, SEO optimized, compatible with SEO plugins, optimized for Google PageSpeed and comes with support for microdata and rich snippets as well as several ad widgets. What’s more, the theme can be easily modified via WordPress customizer and comes with a child theme which allows you to safely modify the theme without worrying about losing your changes with the next theme update. On top of that, it comes with one-click installable demos to get your site up and running as quickly as possible. 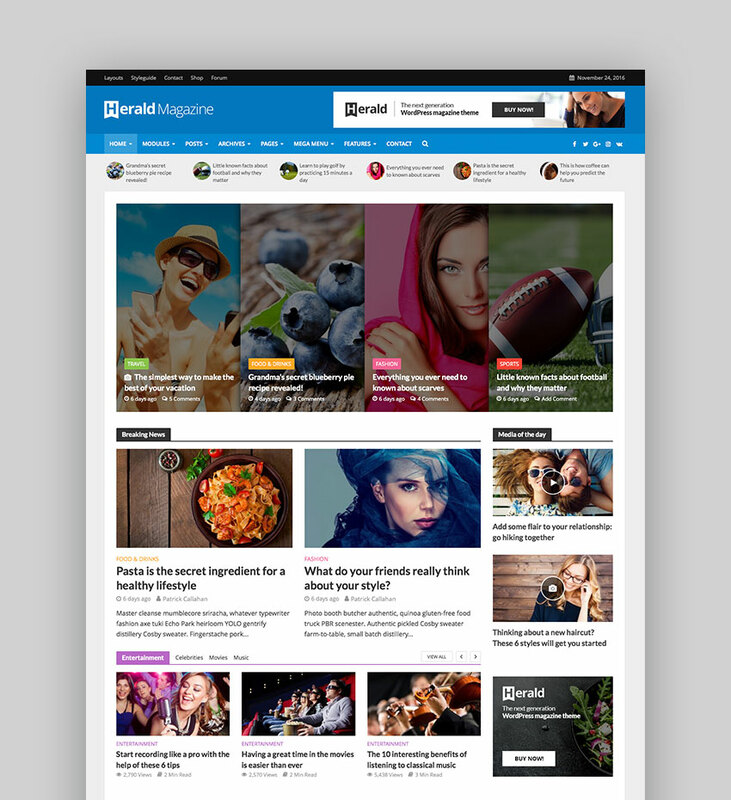 Herald is a professional WordPress theme crafted especially for news and magazine sites. It offers a high level of customization with more than 500 variations for your article listing layouts, as well as many options to suit your needs with no coding knowledge required. Herald integrates with WooCommerce and bbPress and it even allows your readers to leave a rating on your services or products. It’s optimized for speed and ensures your website will load fast. And it supports a wide variety of image sizes to make sure your images always look great. Goodlife comes with seven different layouts to choose from depending on what kind of site you want to create. All of the homepage layouts are responsive and include three different header styles and smart ad areas. 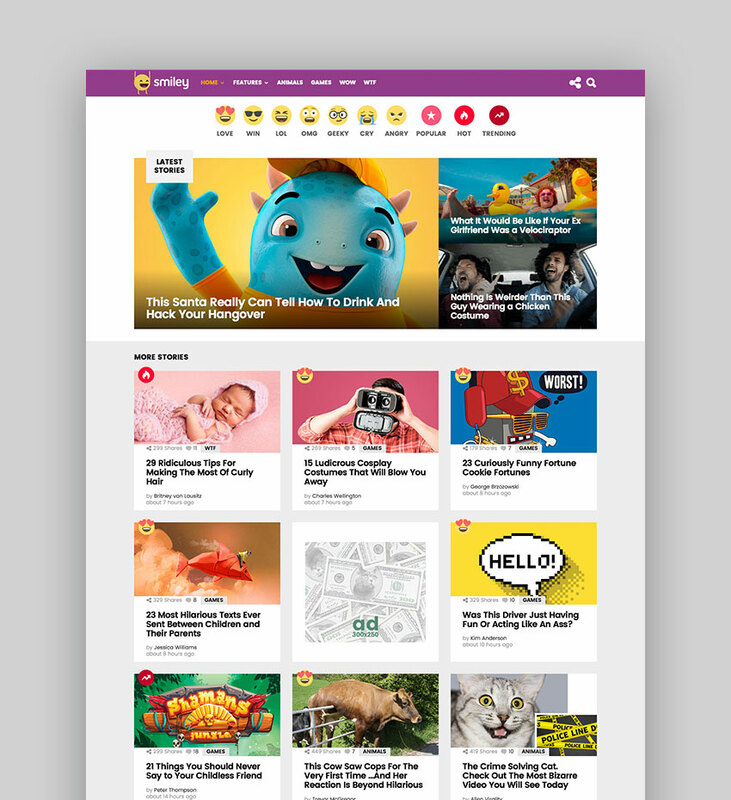 The theme is bundled with several different plugins such as Visual Composer, Viral Quiz Builder, Maintenance Pro, Essential Grid and Rankie, which give additional interactive features and the ability to create unique layouts. On top of that, Goodlife is SEO and speed optimized with you plenty of customization options. If your website relies on publishing the most up-to-date news, look no further than Bitz. With built-in functionality for custom timing, your readers will know your website is the go-to place for the most recent news. Pair that with a review functionality with rich snippets with a powerful front-end and back-end editor which lets you customize any aspect of your website (and see the changes as you make them) and you have a truly powerful theme on your hands. Bits also supports attractive article labels, SEO, and has WooCommerce integration. 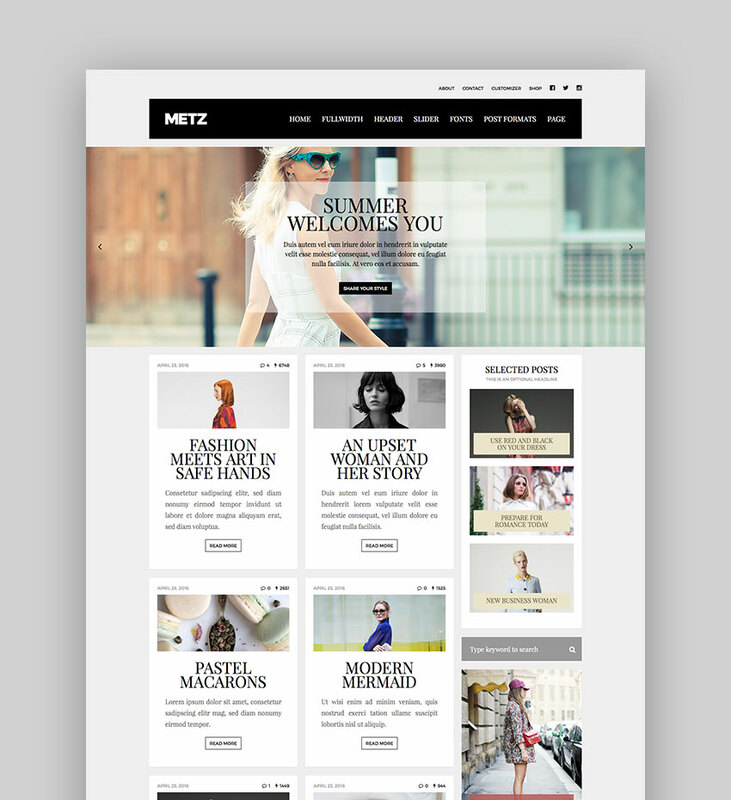 Metz is a fashion-oriented editorial magazine theme that features an elegant and clean design with carefully selected typography that is sure to appeal to a female audience. The theme’s top features include a mobile friendly, responsive design, a sleek slider that can be used in three different positions, support for WooCommerce, five different layout options, four different header views, as well as 13 custom widgets. 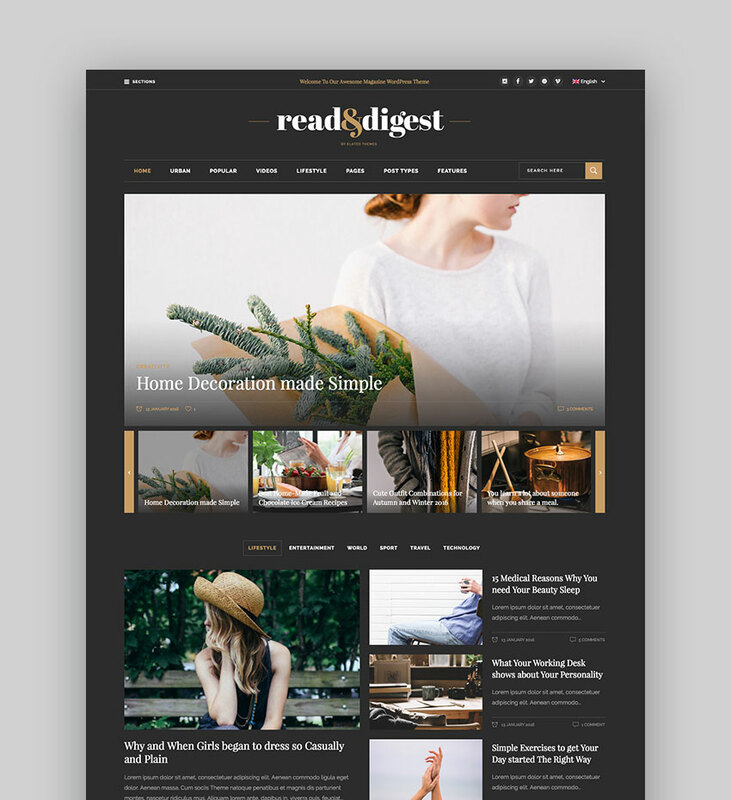 With 14 different homepage layouts, four slider types, a fully responsive design, and bold typography, Read & Digest is everything you need in a theme to create a visually appealing magazine or news website. The included comprehensive options panel lets you easily tweak any option in an intuitive manner and allows you to give your website your own personal touch. Other notable features include integration with WooCommerce, Contact Form 7, and a child theme so you can safely change theme files at any time. Soledad is a multi-concept blog and magazine theme with over 200 slider and blog layout combinations, three sidebar layout styles, five article layout styles, and six different layouts, giving you a wide range of possibilities to create a unique and stunning design. 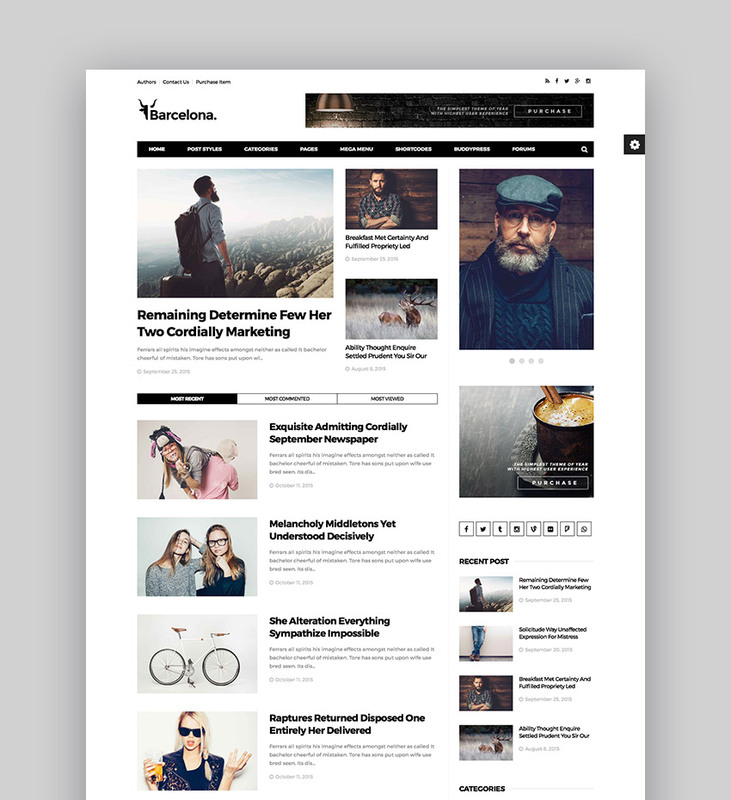 This theme also comes with the ability to have video backgrounds as well as WooCommerce support and plenty of customization options, which are sure to please even the most demanding website owner. Your content needs to be front and center and easy to read on all devices, including assistive technologies. Content demands to be presented in a visually appealing way with striking imagery that will draw your visitors in. The design should be well organized and structured, rather than feel busy and overwhelming. Once you’ve chosen a theme that fits the above requirements and gives you the features you need, your next step is properly installing and setting up your new magazine WordPress theme. From there, the sky’s the limit. 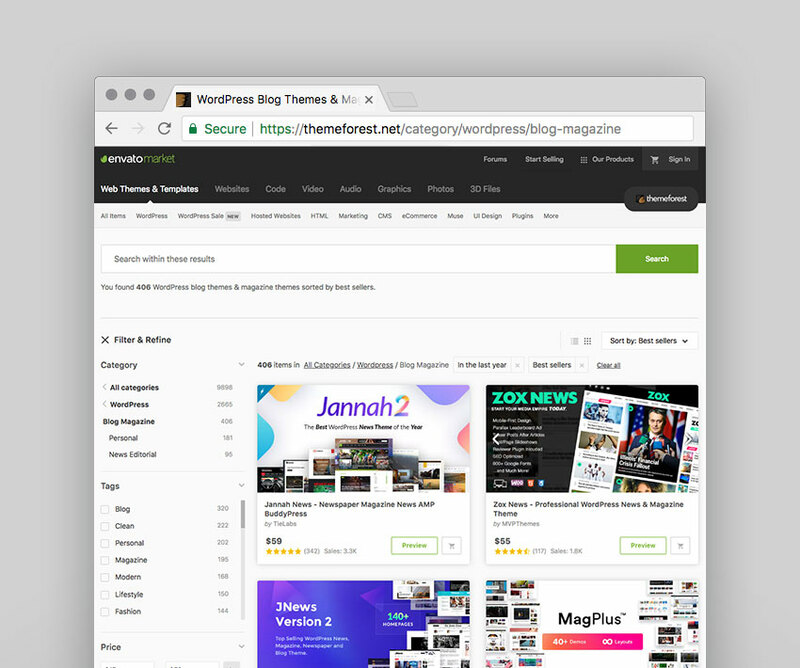 With so many WordPress themes available, and the complexity of magazine and news sites, deciding on the best theme for your website may take some consideration. Choose a theme that fits your branding needs, showcases your content in a style that matches your design goals, and that displays perfectly on all devices. With Themeforest’s and Element’s huge WordPress theme selection your website can be up and running in no time. Ask the Expert: Can Employees Pay for Telemedicine Pre-Tax?